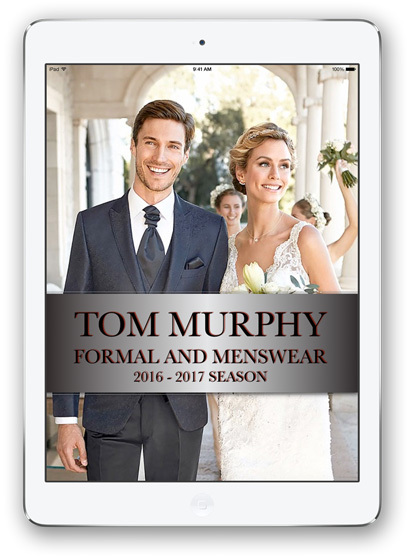 Free Digital Catalogue of our Wedding Suits 2017/2018 collection now available. Phone our customer service team on +353 21 4272401 for details.For options on new wedding suits please refer to the online shop section of this website. Established in 1938 we have been specialising in grooms wear and wedding suit hire since the 1950s.A recent trend is for grooms to buy their suit off the peg from us or made to measure and the rest of the party rent theirs.We offer appropriate advice on how to coordinate the groom’s suit with the rest of the party.We have a beautiful range of coordinating wedding ties and bows that help to tie everything together. People travel from all over Ireland to shop with us because we offer unrivaled service and our reputation has travelled far and wide. We also have a newly refurbished wedding department solely and uniquely dedicated to wedding attire. Some of our newest styles have not yet been added. Whether it is wedding suit hire or tuxedo hire, our staff will only be too delighted to show you the range. As well as hiring wedding suits and tuxedos, we also offer them for sale in our first floor show room or in our online store. For an inside view of how our wedding department operates you can check out this video.